They say that the moment a batsman gets out in cricket is the most absolute form of losing in the whole of sport. No ifs, no buts and over in a split second. No going back and no chance to redeem. Complete and unreserved failure, writes M&C Saatchi chief executive Tom Bazeley, who plans to get in touch with his Welsh roots. Saturday night’s dismal display by England against Australia may have taken more than a split second, but the finality of being ejected from the Rugby World Cup 14 days after it started, surely runs it close. I watched the match in a living room with a rugby referee and a Bath academy player. They know their stuff, and after only 35 minutes of the match their verbal rucking and mauling turned to a more sober discussion on who would replace Stuart Lancaster, and whether he’d resign or get the Twickenham chop. We hadn’t even reached half time. Now I’m very much a glass-half-full type of person, but this put the rest of the game into a different light. 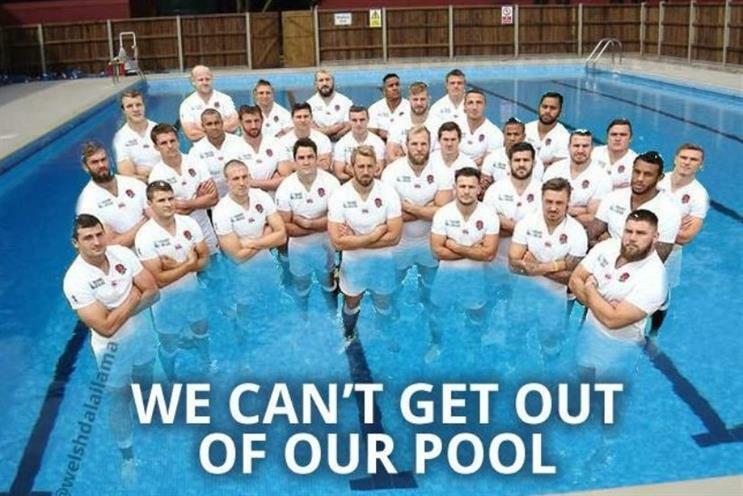 No expectation, no hope, and nothing from the constantly meddled-with England XV to suggest any different. As the majestic Aussies taunted us for the remainder of the game and the horror of premature ejection became a reality, I sat expressionless and without movement, much like the hoardings of the Rugby World Cup’s global sponsors. It’s a truth of commercial sponsorship that the brand is borrowing emotion from the property in question. When things are going well and the feel good factor is in good supply, then it’s OK for a sponsor to stand beside the action and do nothing more than show a logo. But what happens when the feel-good factor is absent? What should a sponsor do when the sponsorship property has generated heartache and disappointment? The reactions so far are varied. Curtailed by the need to speak to every man, woman and child from six different continents, the #BringingRugbyHome campaign from Emirates is choosing simply to ignore the host’s exit. Ironic, as rugby is going anywhere apart from home. Heineken are to be congratulated on backing its sponsorship with some top talent on show in the Heineken Studio. Such a simple and versatile creative vehicle is made for providing a rapid yet nuanced response to the England disaster. But at time of writing, nothing new was being featured. Brands could be there for us in our time of need. Admitting that it hasn’t worked out, but finding an angle or summoning the spirit to carry on. Some of adland’s publishers are even saying that the opportunity for brands aligned to England, like O2, to activate their sponsorship is now "virtually over". Personally, I’m dismayed at such defeatism. More than most sponsors, O2 have earned a right to support rugby, and they do so with a touch that suggests they really understand the English rugby nut. True, we work at top agencies in a city famed for creative thinking, but maybe it’s time to learn a little from the sports we advise. Sport is as much about losing as it is winning. The perseverance, tenacity, resilience, grit and sheer bloody mindedness are the qualities we’re all drawn to. We love the guys who drive on in the face of adversity as much as the guys who find winning easy. Why should tournament sponsors be any different? Let’s take Mastercard, for instance. The odd-shaped world visual is all very well, but the Priceless conceit has been used before to tell tales of things going wrong…why not again? Brands could be there for us in our time of need. Admitting that it hasn’t worked out, but finding an angle or summoning the spirit to carry on. With a bit of creative thought and imagination, there is no reason why sponsors can’t reinvent themselves and their role in the tournament. Anyway, did I ever say I was half Welsh? Yn dod ar Cymru! (Ahem). If England go out - what then for the sponsors? How many boots is a rugby player's Twitter following worth?